Let’s start out with a fact. There is no magical formula or secret software package that can be added to a website for increased traffic and then keep it. With that said, there are some tips that can be used to get people to keep coming back to your site. A food truck’s website is only one of many tools that a mobile food business can use to keep an ongoing interest in what you are doing. One of the best ways to keep the site fluid is to add a blog which needs to be updated on a regular basis. The blog will give your fans a reason to keep coming back, but this will only work if you learn how to blog about the things they want to read about and how to present this information. A good food truck website is like having an extra employee. One who works 24/7 and can be the face of your brand, give information, answer questions and even make sales. But what good does that do you if you aren’t getting visitors to your site? Let’s dig in. Step one to getting increased traffic to your website is to provide fun and interesting content. Wit is the symptom of intelligence, and almost everyone likes a witty person. Who doesn’t like to be entertained with a few jokes? Using humor to express yourself is a great way to go about getting increased traffic to your food truck website. Most online blog followers love reading a story. From time to time, write a blog entry about something that has happened to you during your work day. Did something strange happen at the commissary, or did something funny happen during an interaction with a customer? Let your readers know about it. By sharing these stories, your readers will get to know a little more about who you are. Create this connection to keep them interested in continuing to come back to your site to read more of your stories. Everyone likes to learn something new even if they feel they know it all. Your website attracts people who enjoy food and the food you serve. Share some of your personal insight into a particular food or ingredient you use. How you prepare it or some interesting fact about it that isn’t something everyone knows. Sharing these types of fun facts can have people coming back just to learn them. Videos will assist your sites rankings on the many search engines people use to find information on the web. Create a short video that you shows how a home cook can attempt to make one of your menu items. 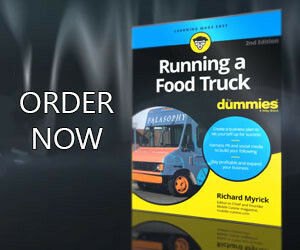 Not only will this teach your readers a thing or two, but you may also find your food truck visits increase as well. Many home cooks will try and fail to match your cooking style and decide it is a better idea to just find the truck and try it from the professional. Everyone can do with a bit of inspiration every now and again. Build increased traffic to your site by providing inspiring content. With your experiences in the culinary world in addition to the trials and tribulations you went through to get your food truck onto the streets, you have a wealth of information you can use to inspire your readers. Share inspiring quotes, or better yet, tell stories that inspired you. We hope these tips help you get increased traffic to your food truck website. In today’s information age, it is no longer acceptable to merely have a website with static information about your food truck. While social media is a fantastic way to stay in touch with your followers, there are times that 280 characters just isn’t enough space to tell the whole story.